The BAUER VTR-1004 is a proprietary format derived from the popular AKAI VT system, but not compatble with it. 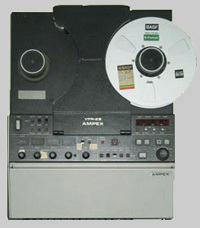 Thanks to a slower tape speed (147,9 mm/sec), the Bauer Videosystem 1004 could record 24 minutes on a reel of only 85 mm in diameter (instead of 127 mm for the AKAI VT system). Despite the age of these tapes, we always succeeded in reading all the documents that were given to us. Regardless of the somewhat low resolution on the picture (200 lines), the result of the conversion to DVD is often stunning.